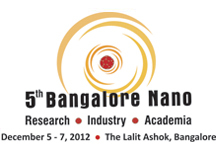 AFTER THE SUCCESS OF THE 4TH NANO,THE FIFTH EDITION IS BACK WITH MORE HIGHLIGHTS AND WILL BE HELD FROM DECEMBER,5TH TO 7TH,2012 AT HOTEL LALIT ASHOK,BANGALORE. This event will offer 3 days of power packed knowledge transfer & networking oppurtunities with industry ,R&D fraternity,Academia and who is who of nano technology industry. The global market for Nano technology industry is worth USD 1.6 trillion representing a CAGR of more than 49% for the period of 2009-13. LEADING GLOBAL STANDARDS ORGANISATIONS ENDORSE OPEN STAND PRINCIPLES THAT DRIVE INNOVATION & BORDERLESS COMMERCE. Five leading global organisations-IEEE,Internet Architecture Board (IAB),Internet Engineering Task Force (IETF),Internet Society and Worldwide Web Consortium (W3C), announced that they have signed a statement affirming the importance of a jointly developed set of principles establishing a modern paradigm for global open standards. They invite other standards organisations ,governments,Corporations and technology innovators globally to endorse the principles,which are available at open-stand.org. "New dynamics and pressures on global industry have driven changes in the ways that standards have developed and adopted around the world" said Steve Mills,President of the IEEE Standards Association. SEMI INDIA , THE GLOBAL INDUSTRY ASSOCIATION SERVING THE NANO AND MICRO ELECTRONICS,MANUFACTURING SUPPLY CHAINS, IS HOSTING THE FOURTH EDITION OF SOLARCON INDIA 2012, AT THE BANGALORE INTERNATIONAL EXHIBITION CENTRE,(BIEC) FROM SEPTEMBER,3 TO 5,2012. Mr.Jagadish Shivappa Shettar and the Guest of Honour will be Mr.Murugesh Rudrappa Nirani,Minister of Large & Medium Industries,Govt.of Karnataka. ASSOCHAM SURVEY- MAJORITY OF CORPORATE WORK FORCE PREFERS MOBILITY. The Associated Chambers of Commerce & Industry of India (ASSOCHAM) interacted with 350 officers,executive and professionals employed in sectors like automobiles,banking and finance,healthcare,hospitality,manufacturing,real estate,retail and others.They carried the survey to ascertain the extent of usage of modern technology amidst corporate employees between May to July in seven cities-Ahmedabad,Bangalore,Chennai,Delhi-NCR,Hyderabad,Kolkata & Mumbai. Over half of full time employees of India Inc.prefer mobility and employing mobile technology into the workplace to stay connected to their associates, clients,coworkers,partners and are seeking exemption from the regular deskjob as per the survey. Apptab iTech UNVEILS TABLET WITH CORTEX A9. Bangalore based APPTAB iTECH Private Limited announced the launching of APPTAB Tablet P five latest models to suit the Indian IT needs. They are Apptab Smile,Apptab Sleek,with android 4.0.3 Ice cream sandwich,Blue tooth , Apptab Geno & Apptab Duniya with Phone,dongle,Bluetooth and GPS and Apptab Vegas 9.7 inch with IPS screen. Apptab Sleek & Duniya models are an original design creation and patented products.The Tabs are available for purchase from today online at www.apptabinfo.com. Addressing the media Mr.J.K.Suresh CEO said," we are pleased to have brought to India sophisticated technology allowing consumers an easy,accessible and affordable option to discover and enjoy the Tablet experience. Consumers will get value for money through the product quality & features ". The coalgate scam ,the offshoot of the CAG report has created a serious deadlock in the Parliament.The coalgate is a serious problem affecting the country as it appears the country's wealth is distributed to few private people who are sitting pretty on the national wealth.The ruling party's argument that the earlier NDA government allotted the coal blocks without auction and they followed the same policy by allotting 142 blocks .Further, the government says that few BJP ruled states have objected to the auction and hence they did not go through the auction route while allotting the coal blocks. These arguments appear strange . In addition, the Finance minister Mr.P.Chidambaram declared that as no coal was mined and is still in the mother earth,there is no loss to the exchequer which is not convincing.The allottees of the coal blocks did not mine as there were environmental issues. I wonder what Mr.Chidambaram would have said if the allottees started mining coal. Whatever may be the rhetoric, the government has to answer few inconvenient questions. The least the government could do is to cancel the allotments and call for auction and allot the coal blocks in more transparent and remunerative way . The responssibility lies with the government to break the impasse in the Parliament as it is the duty of the government to see that the parliament functions smoothly. IS MOON THE SIXTH OLYMPIC RING ? 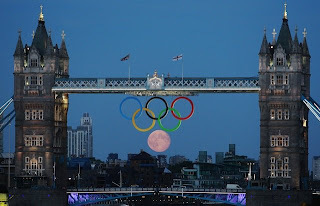 A full moon on Friday night on top of London's Tower Bridge appears as if it is the sixth Olympic ring captured by a photographer from Reuters. 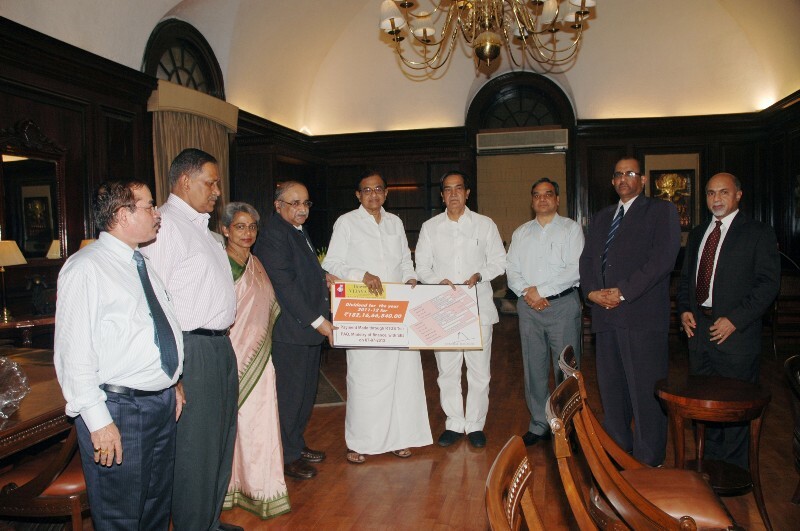 VIJAYA BANK PAID DIVIDEND TO GOVERNMENT OF INDIA. 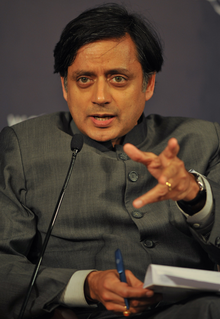 SHASHI THAROOR COMES TO BANGALORE AS AN AUTHOR.-RINGSIDE VIEW OF OUR FOREIGN RELATIONS. Shashi Tharoor,Member of Parliament from Trivandrum was in Bangalore for release of his new book ' Pax Indica' - India and the world in 21st century which analyses India's relations with neighbours. He says that India should play more proactive role in the global arena. He talks in detail about our relations with China. As the old maxim says'If you want peace,prepare for war'.New Delhi's message should be made clear to Beijing that it has no hostile intentions in attending to its own security parameters. '-the book says. The book is published by Penguin Books.